The global collaborative robot market has been anticipated to be characterized by a trend where larger companies could engage in the acquisition of smaller and local automation firms to enlarge their operative base. According to an updated report by Transparency Market Research (TMR), the world collaborative robot market has been expected to testify the launch of several innovations in order to satisfy varying customer demands and requirements. Robert Bosch GmbH, Kawasaki Heavy Industries, Ltd., Kuka AG, and ABB Ltd. are few of the companies that could look to consider the aforementioned strategy when operating in the world collaborative robot market. 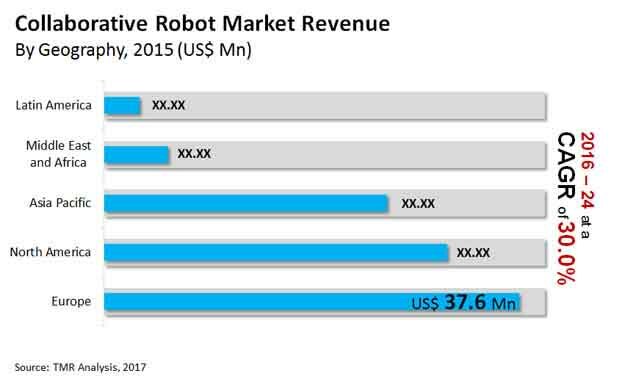 According to the market intelligence report by TMR, the world collaborative robot market has been predicted to reach a valuation of approximately US$950.0 mn by 2024 from an estimate US$116.0 mn in 2016 at a whopping 30.0% CAGR. Payloads segments such as up to 5 kg and above 10 kg could engage in a close battle, however, the latter might just outshine with a 30.5% CAGR. Europe has been envisaged to continue with its winning streak until 2024 while accounting for an almost 34.0% share. The surge in the adoption of automation because of the significant alliance between humans and robots has been envisioned to raise the growth bar of the international collaborative robot market. Collaborative robots take up lesser space and can work alongside workforces in close proximity without posing a threat, much to the advantage of the international collaborative robot market. Their force-limited joints are one of the most desirable protective features in the international collaborative robot market. Moreover, they can be easily programed with no programing experience required. With the need for automation in several industries such as food and beverages, packaging, and automotive, the demand in the international collaborative robot market has been prognosticated to augment tellingly. Low initial cost of ownership encouraging higher return on investment could also aggravate the demand in the international collaborative robot market. More opportunities have been foretold to birth in the international collaborative robot market as affordable prices of computer power and sensors lower the cost of robots. Ease of programing, simplified integration, and nominal aftersales maintenance could be the primary factors lowering the cost in the international collaborative robot market. Manufacturers in the worldwide collaborative robot market could face the challenge of maintaining low prices while refining load and speed capabilities and contributing newer functionalities. As a result, collaborative robots might lack the capability to attain faster cycle time. This could slump the demand in the worldwide collaborative robot market as such robots might not be the best choice for dynamic work environments. However, in the forthcoming years, vendors in the worldwide collaborative robot market have been predicted to benefit from favorable opportunities with multiple advancements in the field of technology. As an obvious scenario, technologies that curb operational cycle time have been prophesied to earn the limelight in the worldwide collaborative robot market. Besides this, the high penetration witnessed in different countries deemed important for the worldwide collaborative robot market could increase growth.